You’ll get a free estimate up front so that you’ll know the cost before we begin the work. We can start immediately or you can schedule an appointment at a more convenient time. Our fees include reasonable labor for demolition, rubbish removal, loading the truck, clean-up, and dumping expenses. Additional labor fees may apply for special projects. 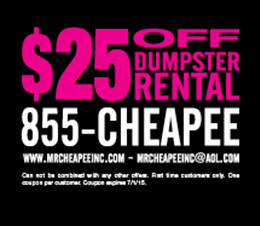 Depending on the county dumping charges, fees may vary. Total customer satisfaction is important to us and we broom-sweep all of our work. Charges for dirt, cement, gravel, roofing material, and other dense and very heavy materials are based on the bed load. Additional labor charges may apply in apartment dwellings, locations that involve unusually long trips to the truck, crawl space, dismantlement, demolition or other labor-intense situations. Toxic chemicals, hazardous materials/products, some paints solvents, asbestos, unknown chemicals, oils, oil drums, and medical waste. E-waste (computers, TV screens, ETC…) can be dropped off at your local BestBuy for no charge. Customers who are uncertain about the total amount of junk to be removed can point to it or tag it while the crew are working. You will receive incremental estimates as the job progresses and the final price will be provided at the end of the job, depending on the volume of junk and how full the truck is.